..... Click the link for more information. , one of the great figures of history, b. Mecca. ..... Click the link for more information. (Quraysh) tribal federation. Muhammad was orphaned soon after birth, and was brought up by his uncle Abu Talib. When he was 24, he married Khadija, a wealthy widow and merchant, much his senior; his position in the community became that of a wealthy merchant. Muhammad had no other wife in Khadija's lifetime. Khadija's daughter Fatima was his only child to have issue. ..... Click the link for more information. . His fundamental teachings were: there is one God; people must in all things submit to Him; in this world nations have been amply punished for rejecting God's prophets, and heaven and hell are waiting for the present generation; the world will come to an end with a great judgment. He included as religious duties frequent prayer and almsgiving, and he forbade usury. ..... Click the link for more information. , of the Prophet (622), the Islamic calendar begins. ..... Click the link for more information. , the City of the Prophet. At Medina he built his model theocratic state and from there ruled his rapidly growing empire. Muhammad's lawgiving at Medina is at least theoretically the law of Islam, and in its evolution over the next 10 years the history of the community at Medina is seen. ..... Click the link for more information. , was able and devoted; he died in her arms June 8, 632.
, a tradition or the collection of the traditions of Muhammad, the Prophet of Islam, including his sayings and deeds, and his tacit approval of what was said or done in his presence. ..... Click the link for more information. . Islamic dogma stresses his exclusively human nature, while presenting him as infallible on matters of prophecy. He is considered by most Muslims to have been sinless, and is regarded as the ultimate subject of emulation. Many believe that he will intercede for the Muslim community on the day of judgment. Muhammad is probably the most common given name, with variations including the W African Mamadu and the Turkic Mehmet. He was known to medieval Christianity as Mahomet. 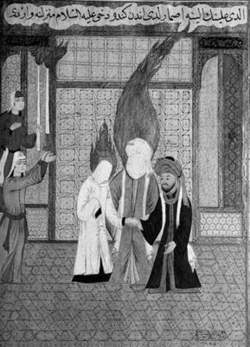 Eighteenth-century Turkish painting of Muhammad pledging daughter Fatimah to her cousin Ali in marriage. The Art Archive/Turkish and Islamic Art Museum Istanbul/Harper Collins Publishers. Muhammad, founder of Islam, was born in 570 CE in Mecca, in what is now Saudi Arabia. At that time, Mecca was a commercial center, a cosmopolitan city filled with the hustle and bustle of caravans transporting fabulous wealth from Arabia all the way to Spain in the west and India in the east. It was also a city rich in sacred sites. The people had a vague idea that Abraham had traveled to Mecca with his son Ishmael. The Qur'an would later describe how the two of them had purified God's house, rebuilding the Kaaba (shrine) that had been destroyed by Noah's flood, but at this time it was a legend known only to a few. The black stone (probably a meteor; see Black Stone), which had fallen from heaven when Earth was cursed following the expulsion from Eden, was here. Even though the world had since experienced fifteen hundred years of ignorance, during which time God had tried in vain to get his unfaithful people to submit to his decrees, Mecca was full of religion. Situated right between two great world civilizations, the Byzantine and the Persian, almost every religion on Earth had been carried here by world travelers. Judea was not far away, and many Jews had fled here following the destruction of Jerusalem in 70 CE. Damascus, Caesarea, Antioch, and Alexandria were all flourishing Christian centers. Christianity itself had recently been weakened by internal arguments about the nature of God. Christians couldn't seem to agree whether God was a trinity, three natures in one God, or a unity. Arguments, violent at times, were common when one camel driver would swear by the One, another would swear by the Three, and then both would begin swearing at each other. The fiercely monotheistic Zoroastrianism had its adherents, and many Bedouin people worshiped Allah, "the God," while recognizing many other local and cosmic Jinns (genies) as well. The moon, sun, trees, and sacred springs—like the mysterious well called Zamzam—all had their own spirits. At two special times during the year, all intertribal warfare ceased so that people could make a pilgrimage to Mecca, run back and forth between the two holy mountains, visit the standing stones, and participate in religious festivals. All this is not to say there was any deeply held conviction about translating religion into ethical behavior. The people may have developed some highly sophisticated mathematics and poetry, but life was often violent, robbery was common, and even the most trivial incidents could spark tribal war that would last for generations. The time was ripe for a new religion that would unify the Arabian tribes and bring order out of chaos while satisfying the spiritual hunger of the people. In the midst of this volatile environment, a man named 'Abd al-Muttalib, who had a number of different wives from different clans, went searching for a bride for one of his sixteen children. For his son 'Abdallah he obtained a woman named Amina. The newlyweds had only one child, and they named him Muhammad. 'Abdallah died, probably during Amina's pregnancy, so mother and child were left impoverished. Following the custom at such times, the child was given to a Bedouin clan so he could be introduced to desert culture. Muhammad was reunited with his mother when he was five years old, but she died soon after, so he grew up with his grandfather's people. It must have been an exciting life for a young child. At least once he traveled with a caravan all the way to Syria. After that it was only natural for Muhammad to find employment in the caravan trade. He soon began to work for a wealthy widow who owned her own caravan "company," and it was not long before he so impressed his new boss that she married him. He was twenty-five years old and just starting out. She was fifteen years older than he, but she soon bore him six children, two of whom died in infancy. Muhammad was now a respected member of Meccan society and might have remained a wealthy caravan merchant all his life were he not given to deep, spiritual contemplation. His wife's money allowed him the luxury of time to ponder religion and spirituality. He took to going out alone into the hills to spend hours, and then days, seeking God in the solitude of a cave on Mount Hira. On one of those trips his prayers were answered in a way even he could never have imagined. And the world has never been the same. Muslim tradition later would reveal that God had had his hand on this man from the very beginning. Mystical stories surround his conception and birth. 'Abdallah, it was recounted, had "a white blaze" between his eyes when he "went in to Amina," but it disappeared when Muhammad was conceived. The light of prophecy had been passed to the next generation. During Amina's pregnancy, a light shone from her that was so bright it could be seen as far away as Syria. At Muhammad's birth, two angels came to open his breast and clean his heart. They proceeded to put him on scales, balancing his life against one, then ten, then a hundred other men. Finally one angel cried out, "Leave him alone, for by God, if you weighed him against all his people he would outweigh them." A Christian monk named Bahira was said to have traveled to see him, discovering in the process that a "seal of prophecy" rested between Muhammad's shoulders. These stories may sound fantastic, but they are no different from medieval stories surrounding the early years of Jesus, the Buddha, and Moses. They are typical of the legends that grow up around heroes. Whether or not any of these things really happened, the story of Muhammad is spectacular enough to stand on its own. He was a deeply spiritual man who cared about God and understood that something needed to be done about the religious chaos of his times. Only a few men in history have been set apart to begin world religions or teach new ways of responding to the divine. Muhammad was one of them. When Muhammad was about forty years old he returned home late one night during the month of Ramadan. He had been visiting his cave of meditation and was deeply moved. He is reported to have said to his wife, "Cover me, Khadija, cover me!" He had had a vision. The angel Gabriel had appeared to him. He came to me while I was asleep, with a coverlet of brocade whereon was some writing, and said, "Read!" I said, "What shall I read?" He pressed me with it so tightly that I thought it was death; then he let me go and said, "Read!" He pressed me with it the third time so that I thought it was death and said, "Read!" I said, "What shall I read? "—and this I said only to deliver myself from him, lest he should do the same to me again. Throughout Muhammad's life he would continue to have these revelations. He would memorize them and later dictate them to a scribe who wrote them on parchment, stone, leaves, or anything else handy. Collected after Muhammad's death and bound in one volume, the world knows them today as the Qur'an, the holy scripture of Islam. unless they have read it in the original Arabic, they have not read it. All they have read is a translation. All quotations that claim to come from the Qur'an are not really holy scripture because they are translations, not the original as dictated from God through his angel. As Muhammad grew in spiritual insight, it was only natural that he would try to teach his Meccan neighbors what he felt was Allah's message for them. But they refused to accept his teachings. His sermons were ridiculed. Although his wife, Khadija, believed him, along with his friend Abu Bakr, his cousin Ali, and Zayd, a freed slave, no one else would listen. After three years, the great world religion that was to become known as Islam had gained a total of about forty followers. God had told Muhammad to preach ethical behavior. The people of Mecca were to give up the worship of false gods. They were to abstain from promiscuity and lust. They were to live virtuous lives, treating each other with fairness and kindness. The reaction in the streets of Mecca was easy to predict. Such a manner of life would be bad for business. A lot of wealthy people had a lifestyle they enjoyed. They liked lust. Promiscuity was fun. Kindness was for wimps. Warfare was wholesome desert behavior. Muhammad? Who was he to try changing a way of life they had lived for centuries? Muhammad preached at fairs and public meetings. He endured the taunts and jeers, eventually having to dodge rocks and stones thrown at him in anger. No one listened to him. The people wanted proof. They wanted to see a miracle. "You have seen a miracle," was Muhammad's reply. "It is the Holy Qur'an." "Not enough!" growled the crowds. And he was threatened with even more violence. They even tried to buy him off, but Muhammad insisted he wanted neither silver nor gold nor power. He just wanted them to repent and submit to the will of Allah. In the midst of all this Muhammad continued to receive visions. One night Gabriel came to him, riding the magnificent steed al-Buraq, "white and long, larger than a donkey but smaller than a mule." Muhammad was taken to the "farthest mosque," and on to the seventh heaven wherein dwelt God himself. The first six levels were guarded by tested and famous personages such as Adam, Aaron, Moses, and Abraham. This mystical experience has become, for Muslims, a metaphor or model for the experience of the spiritual presence of God. Finally, in 622 CE, Muhammad realized he had to leave Mecca and establish a base somewhere else. The oasis town of Medina, about two hundred miles north of Mecca, had expressed an interest in the Prophet's message. On September 24, 622, Muhammad made his Hijrah, his pilgrimage, from Mecca to Medina. This is the date Islam is said to have begun, the first day of the Muslim calendar and the date from which all other time is measured. Muslims mark their calendar years AH, anno hegirae, "after the Hijrah." Those who migrated with Muhammad were known as Muhajirun, the "emigrants." Those from Medina who received him were the Ansar, the "helpers." Together, they formed the community of Islam, the Ummah. But there were those, even in Medina, who refused to accept Muhammad. The Jewish community understandably proved hostile to a new prophet. So most of the Jews were eventually expelled from the town. Some people accepted Muhammad's message only superficially and later came to be known as the party of the Hypocrites. Even within the faith there were disagreements. Some Ansar thought they were being treated less honorably than the Muhajirun. In the battle of Badr, God gave the Medina Muslims victory. This was the turning point for the Muslim community, the proof that Allah would carry out his divine will through Muhammad and the new faith of Islam. The Arabian tribes were finally united. The jihad, the holy war against apostasy, had begun. Damascus fell in 635, Persia a year later, Jerusalem two years after that. Egypt, Spain, North Africa, the Middle East, India, even some of China soon followed. Europe remained free of Muslim control only because Charles Martel turned back the Islamic "desert riders" at the famous battle of Tours in 732. Muhammad, meanwhile, continued to lead the new religion through moral example and extremely persuasive preaching. Emissaries were sent everywhere in the known world. "People of the Book," Jews and Christians, were asked to submit to the God they had ignored. The Holy Prophet's message was clear. There was to be no warfare, no killing, unless people simply refused to obey the commands of Allah. Only then was warfare justified. Muhammad himself destroyed the idols of Mecca. His armies did the rest. Allah finally received the respect he deserved. In March of 632 Muhammad made his final pilgrimage to Mecca. The city had by now been purged of all idolatry. Many of the ancient practices were now given new meaning. The people still circled the Kaaba seven times. They still kissed the Black Stone and ran back and forth between the two hills. They still threw pebbles at the stone pillars and drank from the sacred well of Zamzam. But these activities no longer were considered pagan rituals. They were now the sacred response of submission to Allah. O men, the fire is kindled, and rebellions come like the darkness of night. By God, you can lay nothing to my charge. I allow only what the Qur'an allows and forbid only what the Qur'an forbids. A few hours later, in June of 632 (AH 10), he died in the arms of his young wife, 'Aisha. A mosque was later built to mark the place of his burial. The people naturally were confused. A messianic rumor began to circulate that somehow he would come back to life and return to lead the Muslim movement. O ye people, if anyone worships Muhammad, Muhammad is dead, but if anyone worships Allah, he [Allah] is alive and dies not! I have left you with something which if you hold fast to it you will never fall into error—a plain indication, the book of God and the practice of His prophet, so give good heed to what I say. Know that every Muslim is a Muslim's brother, and that the Muslims are brethren. (also Mohammed; in European writings, often Mahomet or Mahomed). Born circa 570, in Mecca; died June 8, 632, in Medina. Religious leader and political figure; founder of Islam. Contemporary sources for the life of Muhammad have not survived; the first biography was compiled by ibn Ishaq in the eighth century. A member of the aristocratic but impoverished Banu-Hashim family of the Quraysh clan, Muhammad was orphaned at an early age. As a shepherd and later as a merchant’s assistant, Muhammad became acquainted with Judeo-Christian monotheism and other religious and political doctrines both in Arabia and abroad. Marriage to Khadija, a wealthy Meccan woman of the merchant class, enabled Muhammad to devote himself exclusively to religious and ethical problems. According to legend, around 609 or 610, Muhammad, who frequently spent many hours in meditation on Mount Hira, near Mecca, was visited one night in the month of Ramadan by the angel Gabriel, who revealed to him certain parts of a book, called Koran in Arabic, that was kept in heaven under the throne of Allah. In the name of Allah, Gabriel charged Muhammad with conveying the commands of the Almighty to his fellow countrymen. The sympathetic support of his family and friends, particularly Khadija, encouraged Muhammad’s fanatical conviction of the truth of his “god-given” teachings. He rejected the old pagan beliefs and preached about a single all-powerful god. The doctrine of strict monotheism, the universality of the new faith, which proclaimed the equality of all its followers irrespective of social origin or clan membership, and Muhammad’s exceptional political and organizational abilities—all found a favorable response among those representatives of Meccan society, primarily from the middle strata, who sought to unite and strengthen Arabia. Initially the Meccan merchant oligarchy opposed his teachings, and Muhammad and his followers were forced to take refuge in Yathrib, later called Medina. The day of their flight, usually considered to be Sept. 22, 622, is called the Hegira. In 630 and 631 the Muslims, led by Muhammad, subjugated Mecca and subsequently a large number of other regions in Arabia. Muhammad, who was both a religious and political leader, became the head of a new Islamic theocratic state. His tomb in Medina has become the second most important Islamic shrine and place of pilgrimage after the Kabba in Mecca. 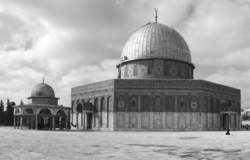 The Dome of the Rock is, according to Islamic tradition, where the Prophet Muhammed was taken to Jerusalem by the angel Gabriel in his “Night Journey” dream. According to tradition, Muhammad, the Prophet of Islam, was born in 570 C.E., the same year Mecca was attacked by the army of Abrahah, ruler of Yemen. At the age of forty, during the holy month of Ramadan while he was sleeping in a mountaintop cave between the hills of Safa and Meeva, near Mecca, he received the first revelation of the Qur’an. By that time, he had already experienced visions of isolated luminous and sonorous impressions that he described as “the breaking of the light of dawn.” He himself was never able to translate some of those images, which appear as isolated letters placed at the beginning of several parts of the Qur’an. In the “Lailatal-Miraj” or (“Night Journey”), the dream in which Muhammad’s religious mission as well as portions of the Qur’an were revealed, the angel Gabriel appeared to him, leading Elboraq, a half-human silver mare. Riding Elboraq, and led by Gabriel, Muhammad traveled to Jerusalem in an instant, and there he conversed and prayed with Abraham, Moses, and Jesus. Continuing on his journey, he traversed the seven celestial spheres. Each sphere is infused with its own color, the esoteric meanings of which relate to the seven levels of existence: material, vegetable, animal, human, and three more beyond ordinary human nature. Then he reached across the ocean of white light, and, finally, he approached God. According to some versions of the story, Muhammad also descended to the depths of the earth. Belief in the inspiration given to Muhammad by the angel Gabriel during this dream is a fundamental element of Islam. According to Muhammad, he is the last prophet placed at the end of a long line of precursors, who had been inspired in the same way. Their inspiration, to which Islamic theology gives the name revelation, was destined to be made public, and such inspiration ceased after Muhammad’s death. Muhammad showed considerable concern for dreams, and it is said that each morning after prayers he asked his assembled followers what they had dreamed, interpreted the most significant dreams, and reported his own. By doing this, he believed he could glean from the dreams any messages from God. The principles of dream interpretation that Muhammad used were common to those of other Near Eastern religions, and much importance was given to truthful telling of dreams, which was best done immediately on waking, as well as to the quality of the dream interpreter. According to Muhammad, a dream is a conversation between humanity and God. Hazrat Mohammad and his two guards were killed on Friday evening when Taliban ambushed them in the Rajan area of the Baraki Barak district, deputy police chief Col.
All units and ships of Pakistan Navy were illuminated to mark Milad Day of the Prophet, Hazrat Mohammad (PBUH), the mercy for all creation. He confirmed Mirza and two others elders identified as Mohammad Ashraf and Hazrat Mohammad were killed by the militants in Sarfaraz and Sher Kala areas. ISLAMABAD -- The 42nd International Seerah Conference concluded on Saturday with a renewed pledge to portray soft image of Islam in the light of the teachings of Holy Prophet Hazrat Mohammad (Peace Be Upon Him). The district chief, Hazrat Mohammad Haqbin, said the clash took place after ANA troops keeping security for the highway came under attack from insurgents. Mohammad Safdar said believes on last Prophet Hazrat Mohammad (PBUH) is an integral part of 'Emaan' of every Muslim. ISLAMABAD -- Speaker National Assembly Sardar Ayaz Sadiq has said that the modern world can attain true peace by emulating the principles espoused by Holy Prophet Hazrat Mohammad (PBUH). LAHORE -- Success can be achieved in this world and hereafter by following the golden teachings of the Holy Prophet Hazrat Mohammad (PBUH). Seerat conferences will also be held by the religious parties, in which local Ulema and Mushaikh highlighted the Sunnah of the Holy Prophet Hazrat Mohammad (PBUH). The farmers, accused of cultivating poppies, were arrested in Pachir Agam, Chaparhar, Kot, Sherzad, Achin and Khogyani districts over the past two days, said police spokesman, Hazrat Mohammad Zmaray. Prominent Ulema highlighted various aspects of Seerat-un Nabi (PBUH) calling upon people to follow the teachings of the Holy Prophet Hazrat Mohammad (PBUH) for their salvation.